As I write this, we are at 30,000 feet, en route to Port Moresby, Papua New Guinea. Today is one year and three days since Michele and I began preproduction on this, our most ambitious IMAX 3D production ever. The logistics have been daunting. I can’t wait to get my hands on the ridiculously huge camera and slate it with brace #1. Soon I’ll be making that first dive and, for me, that’s what it’s all about. 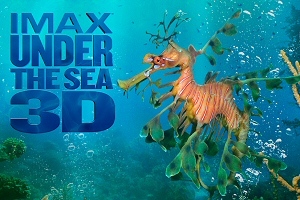 Filmed with the incomparable scope and clarity of IMAX technology, "Under the Sea 3D" offers an intimate look into an underwater world few people have ever seen, and the exquisitely beautiful, sometimes treacherous and often comical creatures that live there. “In addition to Great White Sharks, you’ll see creatures like the Dwarf Minke Whale, the Chambered Nautilus and Big Fin Reef Squid. Our main goal in making these films is to bring animals that are little known, or not known at all, to the screen, to let people see how strange and wonderful they are. Plus,” Hall adds with a smile, “it gives me an excuse to go play in the ocean”— a passion he has been pursuing, and sharing, for more than 30 years. With an aim toward protecting the ocean wildlife for future generations, Hall also believes, “People need a reason to care about coral reefs. My hope is that once they see these animals and realize that they’re not only remarkably beautiful but that they have their own interesting behaviors and personalities, they will fall in love with them and think it would be nice to have them around in coming years. 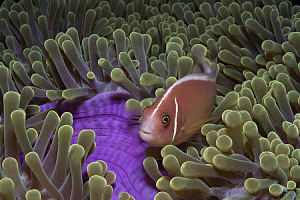 camouflaged in the temperate waters of New Britain, Papua New Guinea. Having explored areas off the coast of California and the Baja Peninsula, North Carolina, British Columbia, the Gulf of Mexico, Hawaii and the Bahamas for “Deep Sea 3D,” Hall and his team wanted the new film to extend into more remote locales. For those interested in looking at our location today on Google Earth, you probably won’t even see the island. This is a small rock less than a mile in diameter. It sticks up like one end of a football and that shape extends down into very deep water. There are only a couple of narrow ridges where we can put our feet down to work. Mostly the bottom is rubble or volcanic rock. Below one hundred feet, though, the invertebrate life becomes prolific and spectacular. off the coast of Papua New Guinea. Just north of Australia and the Coral Sea lies a vast region known as the Coral Triangle. Spanning several hundred miles, it encompasses the waters of Indonesia, Malaysia, The Philippines, Timor-Leste and Papua New Guinea, and extends as far as the Solomon Islands. It is home to approximately 40 percent of the world’s reef wildlife population, including more than 75 percent of documented coral species and some 3,000 individual species of fish, as well as sea turtles, mollusks, crustaceans and marine mammals such as dolphins and whales. Once again, the filmmakers turned to IMAX as the most exciting and authentic way to bring their latest odyssey to life for moviegoers. The Halls agree it’s this level of quality that makes the effort worthwhile. Altogether, production on "Under the Sea 3D" involved Howard and his crew each spending more than 350 hours underwater and 110 days at sea to capture almost ten hours of raw footage—not to mention the daunting task of transporting, loading, assemb ling and breaking down more than 8,000 pounds of equipment, including the 1,300-pound camera in its waterproof housing. for blending in and surviving. Typically, there were four people underwater at any given time—Howard and cameraman Peter Kragh, plus two divers to assist with spotting and maneuvers. 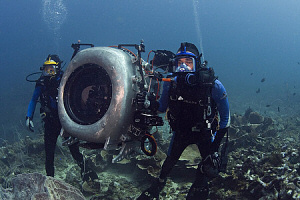 Three additional divers were dedicated to the launch-and-recovery protocol, lowering the camera into position or hoisting it topside for fresh film or new lenses, while Howard and the first team remained below to prepare their next shot. This way, those at the lower depths avoided multiple rounds of decompression and could, instead, remain in place for upwards of six hours at a stretch using closed circuit mixed-gas re-breathing apparatus that allows dives of much longer duration than traditional SCUBA tanks. Meanwhile, on the boat, Michele and two camera assistants supervised the reloading of film and speedy return of the precious cargo to Howard’s waiting arms, aware that every minute’s delay could potentially cost them the best shots of the day. Film rolls through the IMAX camera in double strips, simultaneously capturing left- and right-eye perspective on 15/70mm, making it the highest resolution camera in existence with the most sophisticated dual-strip technology. Its stereo 3D lenses are spaced to duplicate the distance between human eyes, with each lens recording the image received though each eye on the two corresponding film strips. Owing in part to this complexity, each dual roll of IMAX film records only 3 minutes. Consequently, the team did extensive preparation and location scouting before a single frame was exposed. in the South Coast of New Britain, Papua New Guinea. Thanks, was a good read. There are 8 days to the next Jim Carrey movie hits theaters (IMAX theaters). 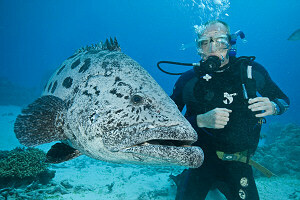 The world premiere of "Under the Sea 3D" will be held already today in LA (February 5) where Jim is expected to attend. The film has been rated G for general audiences and has a running time of 40 minutes and 45 seconds. It opens February 13 worldwide. Check the IMAX opening screens domestically and internationally on Jim Carrey Online in the beginning of next week. Production Journal: April 4, 2008. Today we really got lucky. I think we captured our best sequence so far—after nearly breaking all records for bottom time. It’s been a long day. This morning we took t he camera into the Mangroves. Sky was overcast. We need sun to shoot in the Mangroves but wanted to get in there and practice our camera moves when disturbing the bottom would not be an issue. As we were swimming back to the boat someone yelled down to us that Digger had found three Flamboyant Cuttlefish and that they were mating. We immediately donned re-breathers and were back in the water in five minutes. I climbed out 5.75 hours later. Howard and his crew began their undersea exploration in January 2008 with the first of two separate visits to the islands of Papua New Guinea in the Southwestern Pacific Ocean. It is an area known for its beautifully lush coral reefs and the remarkable biodiversity of creatures that make the reefs their home. Their first stop was Rabaul, on the island of New Britain. But, en route, they received word that a volcano was erupting on that exact spot, forcing them to adjust their agenda from day #1. Noting that their trip to Mexico for “Deep Sea 3D” had included an unscheduled greeting from Hurricane Javier, Howard took the blast in stride and captured the serendipitous volcanic action as their boat retreated from the island. 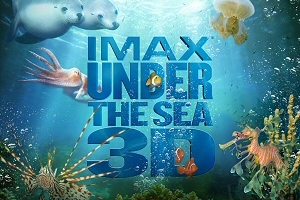 the IMAX® 3D film Under the Sea 3D in New Britain, Papua New Guinea. 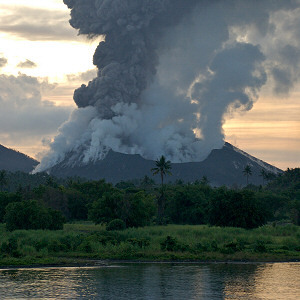 “The good news is that the film now includes footage of the eruption and a hail of ash,” says Michele. Instead, the crew decamped to nearby Linden Harbor, on New Britain’s south coast. There, 15 days of diving, with Howard and his crew logging nearly 80 hours underwater in the largely unexplored reefs, yielded excellent exposure to a variety of rarely seen animals. Among them were a large Crown Jellyfish; a Wonderpus Octopus; and a new species of Lionfish, discovered only two years ago in Indonesia, happily feeding on smaller fish amidst the coral while the camera rolled. Howard observed and filmed a devoted Frogfish couple courting; found an aggressive Tiger Mantis Shrimp—a species twice the size of its California cousins—spearing its dinner and quarreling with a Cardinalfish; and captured footage of an aptly named Crocodile Fish lunging directly at his lens in pursuit of an agile Blue Chromis (that got away), an action that is especially striking in 3D. During the second Papua New Guinea trip, to Milne Bay this time, he recorded a blue-spotted Stingray vigorously burying itself in the sand, and a rare glimpse of an Epaulette Shark, “a small shark that walks on the ocean floor using its fins,” found only in the Milne Bay area. Production Journal: June 9, 2008. No one saw the shark coming. It showed up out of nowhere. The moment Mark noticed the 15-foot beast it was four feet from my right ear. By the time I turned to see it, it was less than three feet away. That it got so close without us seeing it was very disquieting and certainly quite exciting. Of course, for something bad to have happened, it would have needed to be in the mood to bite something. From New Guinea, the diving team traveled to points in Southern Australia and later to the Great Barrier Reef, the world’s largest coral reef system that forms a natural breakwater off the coast of Queensland. The Great Barrier Reef is home to some 2,800 species of sea life and 400 kinds of coral. Diving here is world-famous. Great Barrier Reef of Australia during the filming. They filmed several smaller varieties of shark while in Australian waters but the Great White was their prime quarry. With the help of famed shark attack survivor and marine conservationist Rodney Fox, the crew set up a protective cage and went in hunt of their stars in the North Neptune Islands. Owing to the girth of the IMAX camera, Howard and cameraman Peter Kragh were unable to close the fourth side of the ir protective cage but, he explains, they felt safe in knowing that, “the shark would have to eat 1,300 pounds of aluminum before he ever got to us. Still, it wasn’t an average shark dive because we were often outside of the cage with the Great Whites, and that in itself was a rush.” The most vulnerable stage of the operation would be lowering the cage, camera, lights and weights into position. The set-up caught the attention of five Great Whites, who circled numerous times during the three-hour dive, allowing for some excellent tracking shots and close-ups. Often they would turn so close to the lens it was impossible to film and once a shark collided so hard with the cage that it dislodged a tooth, which then floated gently and magically down to land in Howard’s open palm. A second dive yielded additional exciting close-ups, including a pair of 14-footers that approached so tightly and veered off so sharply that one brushed the camera port with its fin. But the moment no one will forget is when that one 15- footer suddenly materialized as the team was floating out of the cage and unaware. In addition to the Great White encounter, underwater action in the Australian waters included Giant Stingrays spanning up to six feet in diameter, with venomous barbed tails, curious Dwarf Minke Whales that liked to swim in behind the camera and then dart away, and a variety of creatures whose fanciful names suggest what they look like: the Lined Butterflyfish, Bumphead Parrotfish and Potato Cod. 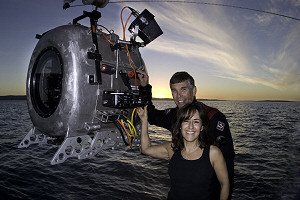 in the Great Barrier Reef of Australia during the filming. 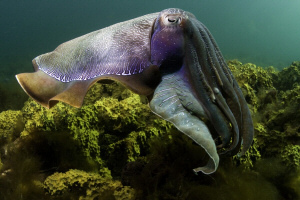 South Australia is home to the Giant Cuttlefish, kin to the Flamboyant Cuttlefish the Halls found in New Guinea but many times their size—in fact, the largest cuttlefish in the world—and every bit as colorful. Here they were also conducting courtship rituals but unlike the more light-hearted footage Howard gathered earlier, this group offered some fearsome and splendidly photogenic threat displays from competing males. “They pretty much fill the frame even when three feet away,” he says. 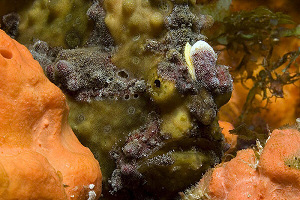 “Their faces appear two feet across and their long tentacles should appear to reach out to touch a viewer’s cheek.” Days later, the director rounded out his sequence by overseeing a battle between a hungry cuttlefish and a feisty crab. No one was betting on the crab but he put up a good fight. A 90-tentacled Chambered Nautilus that prefers cooler temperatures took the divers down to 155 feet on the Great Barrier Reef, a record depth for filming with the IMAX 3D camera. A representative of a diminishing species, the Chambered Nautilus in its lustrous shell is one of only six existing varieties of nautiloids that once numbered 2,000. Howard also broke a record here for time logged underwater in a single dive, in his six-hour pursuit of the remarkably comical—but lethal—character called a Reef Stonefish, so named because it blends in with rock formations on the ocean floor in order to ambush its prey. A member of the Scorpionfish family, displaying what he affectionately calls “the ugliest face you’ve ever seen,” the Stonefish is the most venomous fish on the planet. “The Leafy Sea Dragons in particular look like something from science fiction,” offers Toni Myers, referring to the way in which these creatures resemble more vegetable than animal, with multiple leaf- life extensions that drift around their bodies as they glide through the water like bits of floating seaweed. the waters of the Hopkins Island in South Australia during the filming. Less playful were the encounters captured between Green Sea Turtles and jellyfish. Unlike humans, the turtles are immune to the jellyfish’s venomous sting and apparently find the delicate animals delicious. Howard and his film crew spent hours closely chronicling three turtles voraciously feasting on their favorite meal. Production Journal: October 3, 2008. If someone had told me there was a place where Garden Eels rise more than six feet above the sand I would have thought the claim a gross exaggeration. But as I stood behind the IMAX 3D camera today, waiting hour after hour for the eels in front of the lens to come out, I could see eels in the hazy distance that were taller than me, by at least a foot! This enormous field of eels surrounded us as far as we could see in any direction. The last leg of their journey took the crew northward to the waters around Indonesia in the Coral Triangle and “some of the most isolated reefs in the world,” says Howard. “Our primary goal was to capture the breathtaking colors of the reefs in the Coral Triangle.” Additionally, they investigated the roots of the coastal Mangrove forests where they extend into the shallow water and provide shelter and feeding grounds for numerous small fish. That accomplished, they turned their attention to the eel population, getting what the director estimates as “the most intimate look at Garden Eels every captured on film.” Contrary to their name, these were hardly garden- variety eels; they were giants. Initially shy about the lights, they retreated into their burrows as soon as they were approached, requiring the dive team to bide their time for hours until they re-emerged. But getting footage of so many enormous eels swaying gracefully in the current was worth the wait. as it plunges into the waters of Indonesia on another shoot. Wrapping up their exploration, the team continued to log one fascinating image after another: a rarely photographed honeycomb Moray Eel with black spots, schools of Striped Catfish, yellow and black Ribbon Sweetlips, Skunk Anemonefish and even some oceanic slapstick of a small Carrier Crab hoisting a complacent Cassiopeia Jellyfish onto its back and ambling away. 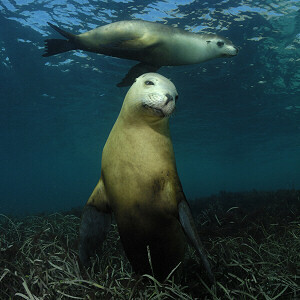 One of the points "Under the Sea 3D" illustrates is how these species are interconnected—with each other and with their habitats—and evolved in ways that make it possible for them to live and thrive. Small, agile fish known as Cleaner Wrasse get their meals by grooming dead skin and parasites from the mouths and gills of larger carnivorous species. The larger fish, in turn, refrain from eating the Wrasse because they value the service. Keen-eyed gobies often share their dens with shrimp, which are blind but are excellent burrowers. Staying close to the goby, shrimp are warned of approaching predators; meanwhile, they employ their digging skill to enlarge the goby’s home. The coral reef, itself alive, provides a refuge for many animals, as well as a hunting ground for food and a place to spawn. As Howard observed in “Deep Sea 3D” and reiterates here, “If you remove one element from the mix, things change. Remove several things and the system collapses. “It’s a complicated situation,” he grants. 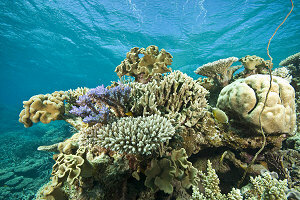 “There are many issues affecting the coral reef. Industries, especially in the Third World, have a major impact. There’s a lot of benefit to people from that kind of development but there is also a benefit to people to have the coral reefs and not to allow them to die off. 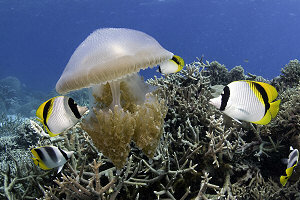 as it shows off its potato-like markings in the Great Barrier Reef of Australia. “One of the things affecting coral reefs on a worldwide scale, and especially the Coral Triangle region where you have the greatest biodiversity, is climate change—specifically the increase in carbon dioxide levels in the atmosphere. Not only does carbon dioxide create the greenhouse effect that causes global temperatures to increase, but it also dissolves into sea water, altering its chemistry from alkaline to more acidic. It’s not a big change, but it affects some very important chemical reactions. Most importantly, it hinders the formation of calcium carbonate, and calcium carbonate is what makes the coral reefs themselves, as well as the shells of animals like mollusks, clams, and the Chambered Nautilus,” he explains. Production Journal: January 11, 2008. No matter how carefully you might plan, anticipating every imaginable contingency, nature often has a way of sending a large white pelican soaring high overhead to drop an enormous deposit of wet and pungent humility right on top of your head. No pun intended, but securing the best possible footage of this underwater panorama requires, foremost, an ability to go with the flow. “Animals have free will. Some days are great, and others are utterly useless,” Howard acknowledges. Often, creatures he planned to film during a period that should have been their standard mating or feeding time did not exhibit the expected behavior. They shied from the dive crew and, regardless of how long he and his colleagues patiently waited, simply did not return. 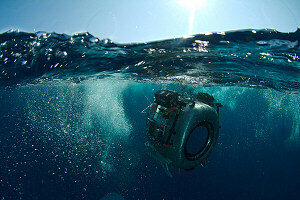 Locations that had teemed with life during scouting dives mere months ago could be curiously calm on a second visit. Unpredictable weather and shifting tides frequently produced currents so strong they nearly swept the camera away or completely obscured visibility. Above the water line, the boat was once engulfed by a swarm of bugs so dense it was impossible to reload film. Another time, following a successful session, the camera housing was opened to reveal a live moth that had been inexplicably trapped inside. It wasn’t until several anxious days later that Howard learned the insect had unfortunately spent most of its time on the camera port, right in front of the le ns, while the camera was running, and nearly ruined one of the team’s best sequences. If the agenda was set for one animal but something rarer presented itself, the team would abandon Plan A in favor of the more cinematically promising show, hoping to capture their original subject later. “It’s impossible to know when the action happening in front of the camera is going to be an easy shot, reproducible any day of the week, or when catching a certain behavior on camera is a once-in-a-lifetime opportunity,” says Howard. another exhilarating shoot in Milne Bay, Papua New Guinea. In a lifetime of wildlife cinematography, he has learned to seize his opportunities. “It pays to be ready for anything. Sometimes you get a lucky shot. But you can’t get lucky unless you are down there trying.” Overall, the disappointing dives and wasted hours were far surpassed by exceptional action and moments of sheer exhilaration. Says Howard, “I think everyone involved would agree that it has been well worth the effort. "Under the Sea 3D" is visually dazzling. Seeing, in IMAX 3D, the hard and soft corals surrounded by myriad species of fish in a way that is near virtual reality is an amazing experience. Audiences will not be cold and wet, but what they’ll see when they look through those goggles is exactly what we saw through the dive mask. It is my hope that there will be times they won’t know what they are looking at until it is in their laps.